If you intend to buy a house recently, you already know that shopping for a new home in a red-hot market is not an easy task. Properties located in much-appreciated neighborhoods are so valued and in great demand that buyers are often forced to buy hastily without even considering housing inspections or financing clauses. As a consequence, homeowners often buy before they sell their actual house. They face then a delicate and tricky financial situation. Fortunately, private lenders offer an easy solution to help them with the transition from their current house to the future one: bridge loans. 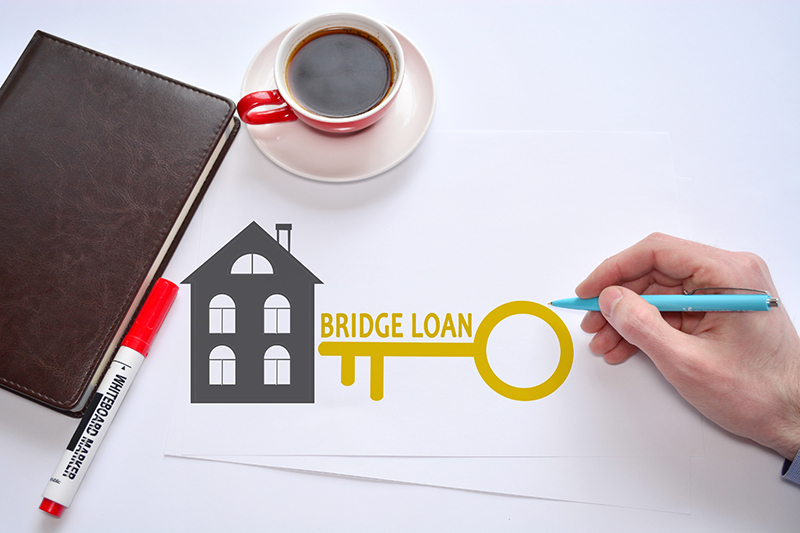 A bridge loan is a short-term financial solution provided by banks or private lenders for those who are buying a new house even before selling their present residence. This loan allows the homeowner to finance the down payment for the new property with the actual house net value. These kinds of loans have generally a duration of six months. However, some private lenders offer shorter terms such as 90 days or longer terms like 12 months. The amount of a bridge loan depends on several factors. Subtract the value of the mortgage and the initial deposit to the purchase price of the new house and you will obtain the amount of a bridge loan you may receive. It is important to distinguish bridge loans from traditional loans. Bridge loans are convenient for people who need access to funds quickly and easily. They have a faster application, approval and funding process than conventional loans. It is also important to note that bridge loans are used only for a short period of time. For example, mortgages are used to finance real estate purchases. They are long-term solutions which the borrower reimburses over the years. In these cases, the home buyer pledges the new house to the bank. If there is a late payment or default of payment, the bank claims the property. Similarly, your current home is used as collateral in order to get a bridge loan. Before even applying for a bridge loan, you need to pay attention to some important disadvantages tied to this kind of loan. It represents higher risks for consumers. The borrower has no guarantee that the actual house will be sold during the term of the loan. In fact, a home sale falling apart before the transaction is officially completed can heighten the risk that the homeowner is left with two mortgages. As a result, bridge loans are risky for banks and private lenders. This is the main reason behind their high-interest rates and administration fees. Indeed, bridge loans are more expensive than traditional mortgages. Because of this risk, it is more difficult for homeowners to apply for this particular loan. Qualifying for a bridge loan means being able to carry this loan plus a mortgage at the same time. Your credit score plays a big part here. You also need to know that the cost and the terms and conditions of bridge loans are quite variables. Therefore, it is important for you to research the best offer for your case. Do not underestimate this step. If you desire the most beneficial deal, take the time to do a detailed search. Even if these elements may seem unsettling, many other factors make bridge loans advantageous. Bridge loans are one of the most useful loans in the housing market. Thanks to bridge loans, you can secure opportunities you might otherwise miss out on in the real estate market. The housing cost is more and more expensive in many parts of Canada. Bridge loans allow individuals, couples and families to buy their dream house by providing the necessary funds. Receiving a bridge loan takes all the stress away. You will not feel the financial need to sell your house quickly. Moreover, you will have access to the funds and time essential to do renovations in the new house before moving in. In other words, bridge loans come with peace of mind. If you respect all the terms and reimburse on time, your overall creditworthiness will improve. They will be able to gain access to lower interest rate loans. On the other hand, this is a major fact for people who have some trouble obtaining financing from banks because of their low credit score. Bridge loans do not always require monthly payments. In most cases, the lender only asks for repayment once the old house is sold. This is extremely advantageous if you do not want to bear the financial burden of the monthly installments. Where can you get bridge financing? Even though bridge loans are common, they are not offered by all financial institutions. Many banks propose this type of loan, but they usually want you to take a mortgage from them as well. You should also know that banks’ criteria are strict. However, if you need the funds rapidly, private lenders may be a better option. As a matter of fact, private lenders work under shorter and quicker time frames than banks. Indeed, their application process is fast and efficient. They accept also more easily people with a weak credit report. They are the perfect solution for the ones who are in a particularly sensitive financial situation. The required documents can differ depending on the bank or private lender, but some elements are automatically asked. As mentioned earlier, your credit report plays a big part. It helps determine if you are a risky or safe borrower. The credit score is range from 300 to 900. Results of 575 and under are weak. A low score means less chance to receive financing. If you are in this situation, do not worry, there are many ways to improve your credit score. A proof of income can be asked by the lenders. Some require to be qualified by the Gross Debt Service (GDS) and Total Debt Service (TDS) ratios. GDS ratio corresponds to the percentage of your income needed to pay your housing costs, whereas TDS ratio is the percentage of your income needed to cover your debts. Lastly, private lenders do not provide financing if there is not a suitable amount of equity in the home. It is important to note that sometimes they ask a fee for an appraisal to ensure there is enough equity. The application process is similar from one private lender to another. However, as a unique type of loan, bridge loans have some specifications you may want to know before and while you are applying. The biggest mistake you can make is to apply for a bridge loan impulsively. You need to be one step ahead. Start your research as soon as possible, and find a private lender just before you purchase your new home. After the deal is complete, you can start the application process, and you will receive your loan quickly. You won’t waste time. As is any other financial product, you need to compare different private lenders. The rates are already high, so try to get the best deal. Because of the short term, private lenders expect that you repay the loan in regular payments. Consequently, make sure you can respect the terms of the payments. Homeowners can only be eligible for a bridge loan if a firm sell commitment has been placed on their actual property. In addition, because of the increased risk, you will need a strong credit report to get a bridge loan. You may not know, but it is recommended to apply for a bridge loan and a primary mortgage at the same time. Combining and borrowing them from the same lender can save you money on closing the deal. Consider carefully the duration of the bridge loan. Your house may not be sold in three or four months, it can take time. Try to obtain a loan that duration is equal to or longer than six months. Finally, use the revenue from the sale to pay the bridge loan. It can seem tempting to spend it right away, but you do not want this debt to weaken your financial health. Interest rates can go up fast. Although bridge loans are popular in the real estate market, they are also used for other financial conditions. Businesses can borrow this type of loan to cover expenses. For instance, a company is doing a round of equity financing expected to close in six months. Equity financing refers to the sale of shares to raise funds for business purposes. This company can opt for a bridge loan to cover its payroll, rent, inventory costs and other expenses until the round of funding is over. Bridge loans can benefit buyers who purchase commercial properties. In this specific situation, bridge loans are called commercial bridge loans or commercial mortgage bridge loans. The most common use is to finance renovations before the commercial property can qualify to permanent financing. In conclusion, bridge loans serve many short-term purposes. Even if they have higher interest rates than traditional loans, they can allow the homeowner to buy a new house without any financial pressure while improving his or her creditworthiness. Looking at the real estate market nowadays, bridge financing might be indispensable. Previous Previous post: How to improve credit score after late payment? Next Next post: What Are Installment Loans?